Piquant Pasta and Tuna salad is simple to prepare and lovingly remembered by everyone. You can have this colorful and delicious salad along with your much loved meals or you can dish it up alone for a light lunch. The rich vinegar-sugar dressing complements the salad with its sweet-sour flavor. Serve up the Piquant Pasta and Tuna salad warm or cool it for some time. But make sure not to chill it by over-freezing. Add the pasta to boiling water and cook for at least 10 to 15 minutes or until tender. Remove from heat once al dente and drain well. After that, rinse them with cold water and drain once more. Set pasta aside for now. Set a saucepan on your stove over medium heat and pour in 1 tablespoon of extra virgin olive oil. Stir in finely chopped onion and garlic and fry them for approximately 3 minutes. Add in the remaining 1 tablespoon of olive oil and the delicately sliced courgettes. Cook this mixture for 3 to 5 minutes, rousing often. Add caster sugar, red pesto sauce, white or red wine vinegar, and capers to the onion mixture in the sauce pan. Stir in the tomato wedges and cook the mixture for three to four minutes or until all ingredients incorporate to form a rich and smooth dressing. Remove the dressing from heat and pour it into a large serving bowl and set it aside to cool. 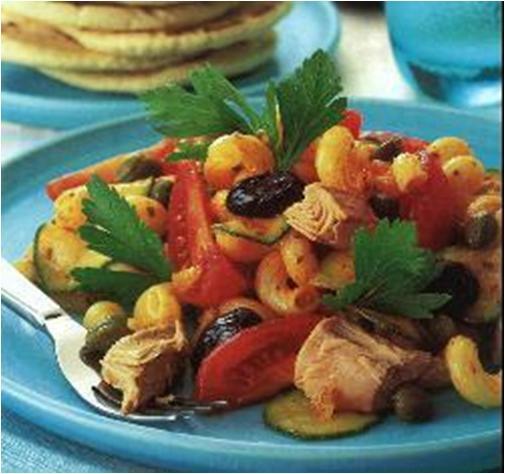 Place the cooked and drained pasta in the serving bowl and smoothly mix in the halved black olives and tuna fish. Garnish the Piquant Pasta and Tuna salad with some fresh flat-leaf parsley and serve.